It’s the time of the year for scrumping. Twice this weekend we’ve been into the bush – officially owned by our local brewery, but effectively open space used by the whole neighbourhood – to hunt for blackberries. The dictionary characterises our activity as a form of stealing, but we perpetrators prefer to see it as the prevention of waste. Somewhere deep in our hunter-gatherer DNA is an aversion to leaving food to rot. And that’s what would happen to the fruit if we good citizens didn’t go about our business. 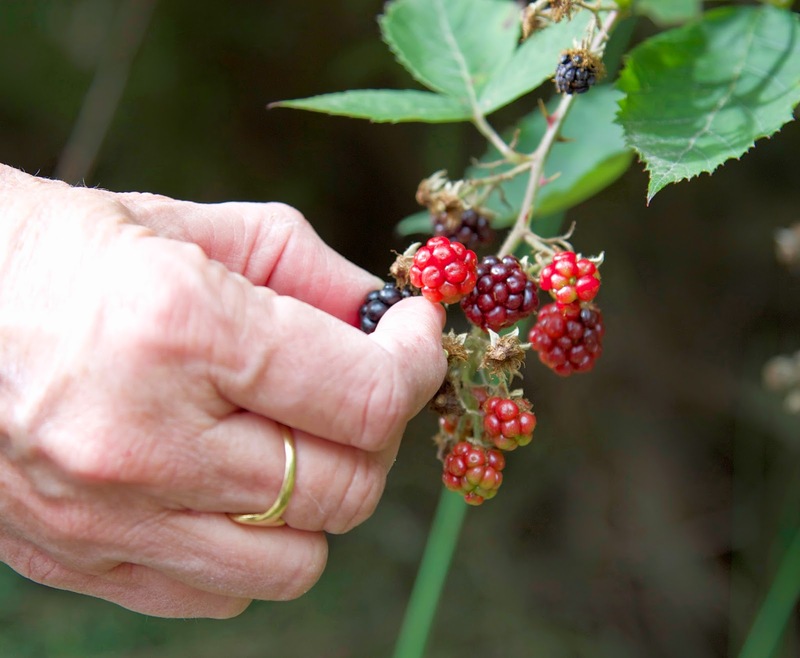 We could even argue that picking blackberries is a form of environmental action. That may be a bit of a stretch, but it is true that every blackberry kept from a bird’s gullet is one less bundle of seeds released into the bush. In truth blackberries (Rubus fruticosus) are a scourge; officially a “weed of national significance” in Australia. Apart from being horribly prickly, they choke up great swathes of bush; infest river banks; take over otherwise productive land; and provide food and shelter for pest animals. On top of all that, they can grow very rapidly (50–80 mm a day), spread easily, and are extremely difficult to eradicate. That’s not what we’re thinking about as we amble along the back track. 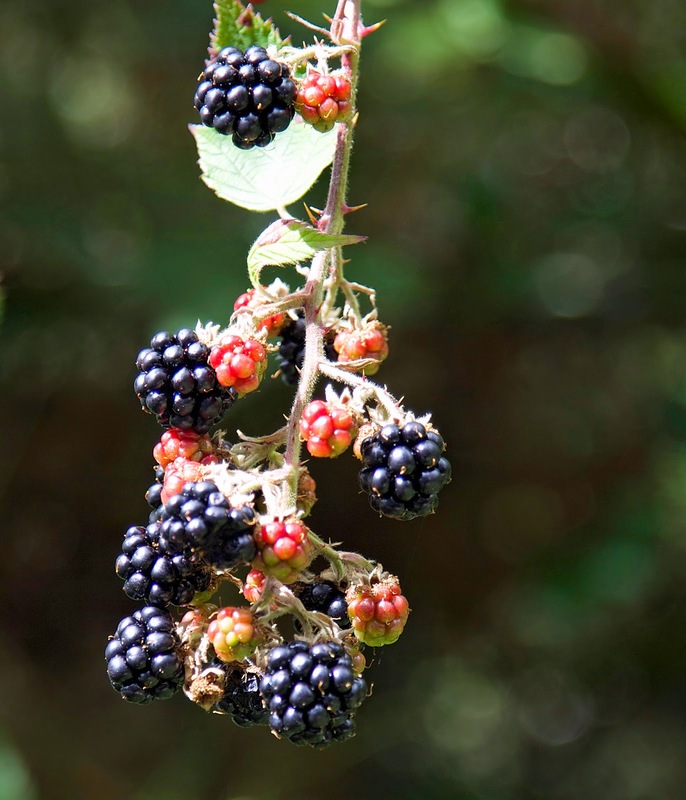 Our hunter-gatherer eyes are solely focussed on finding the semi-hidden black fruit within the rambling brambles. It’s the sweet fruit that’s the undoubted prize of the hunt. And, I wonder, is the fruit also one possible reason for land owners sometimes being half-hearted about eradicating blackberries? Seeing berries is one thing; picking them is another. I remember childhood scrumping expeditions that involved a corrugated iron sheet, which we stored in the bush. Each picking season we’d uncover it, and use it as a ramp over the brambles. It gave us access to some otherwise unreachable fruit. Lynne and I lack the corrugated iron, and have to rely on care and stealth. Sometimes the brambles seem to see us coming, and their prickles turn to face us. Even through my shirt I take the odd flesh wound, while Lynne is spiked in the thigh through her jeans. But it’s our hands that suffer the most. One especially savage thorn spikes my little finger, which spurts like Snow White’s. The damage is all worth it. We carry home 2kg of fruit and a pair of smiles. We freeze some berries for later, and turn the rest into a pair of truly wonderful cobblers. Simpler and quicker to make than pies, and every bit as delicious, cobblers were often promoted during times of food shortage. They use less butter and less flour than a traditional pie. And somehow, if you’ve picked the blackberries yourself, the cobbler tastes even better! That “forbidden fruit” aspect of scrumping is surely one of the attractions. But the proof of the cobbler is in the eating, so here’s our recipe. 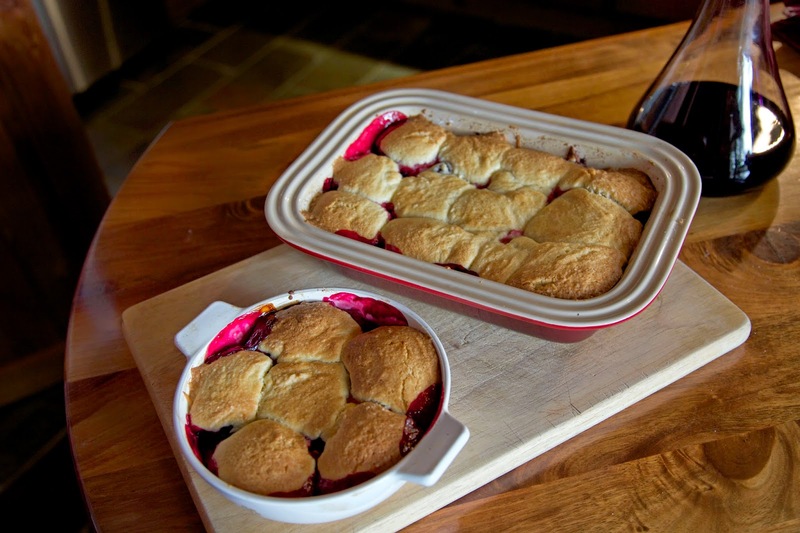 Makes: 1 large cobbler, 7-9 servings. · Put the blackberries, apple, sugar, lemon zest and juice, cinnamon and cornflour in a 20cm X 20cm baking dish. Stir to combine everything and make sure that the berries are all evenly coated with the sugar. Leave for 30 minutes or so till the berries ooze juice. · Preheat your oven to 175°C (350°F). Whisk together the flour, 3 tablespoons of the sugar, the baking powder and salt in a medium bowl. Cut the butter into the flour mixture using fingers or a fork until it looks like coarse crumbs. Make a well in the center and stir in the milk and beaten egg. Mix together until the dough is just moistened. · Scoop up the dough in a large spoonful, and drop spoonfuls roughly evenly over the berries in the baking dish. Bake for 30 minutes at 175°C, or until the berry mixture is bubbly and the topping is lightly browned. · Serve with natural yoghurt (or cream or ice-cream, if preferred).